So, I now have a new favourite Quincy. After seeing Hitsugaya and Matsumoto take down Bazz-B, the rest of the Soul Reapers get a sudden morale boost, and start to realise that they can defeat the Quincies even without their Bankai. Meanwhile, Marechiyo is not quite so lucky, as he’s being thrown into a wall by BG9, who is asking for the location of Sui-Féng (and acting like a robot). Despite his best efforts at interrogation, BG9 realises that Marechiyo is either lying, or doesn’t know where his Captain is. And now things get dark. BG9 extends his arm…blade…thing and smashes the wall beside Marechiyo. When his arm comes out from the wreckage, it turns out that he skewered Marechiyo’s little sister, and threatens to kill her and the rest of his family if he doesn’t divulge Sui-Féng’s whereabouts. In a sudden fit of anger, Marechiyo smashes his mace into BG9’s face, and orders him to let Mareyo. Sadly, this does nothing, and BG9 calmly states that if he does let the girl go, she’ll die of blood loss before anyone can help her. Is it just me that thinks he sounds like a game show host? He deflects another of Marechiyo’s attacks, and it turns out that his entire body is made up of the long, thin wires that he impaled Mareyo with. 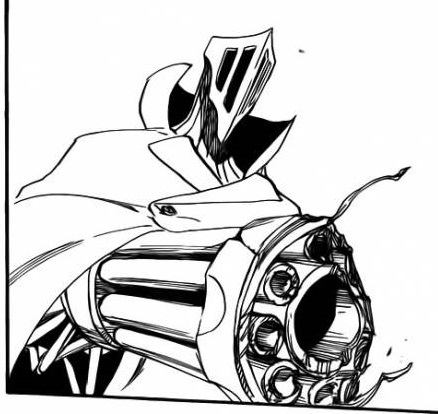 After giving Marechiyo 15 seconds to answer his question, he pulls out a massive gatling gun and fires at his opponent. However, the barrels are ripped apart before he can even use it, and he turns to see Sui-Féng holding the barrels whilst taunting him. Wait, shouldn't someone who looks like a knight use a sword or something? After BG9 does a little more analysis, Sui-Féng reveals that she spent her time training to perfect the Shunkou technique that she tried to use way back in her fight with Yoruichi. 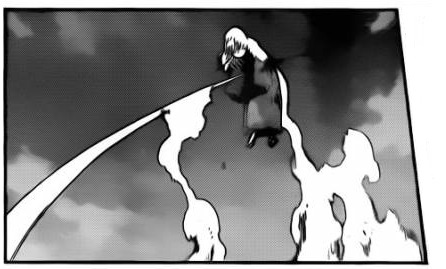 Thanks to her Bankai being stolen, she was finally motivated to perfect her technique, and finished it just in time to save Marechiyo. Within the space of a few seconds, she lunges forward and punches BG9 across the battlefield. Back with Hitsugaya’s lot, they see the explosion from Sui-Féng’s attack, and realise that she’s winning her fight too. However, their happiness is short-lived when it turns out that not only is Bazz-B still alive, he’s still perfectly able to fight. Similarly, BG9 stands up and emerges from the dust clouds with a fairly effective case of glowing evil eyes. Although Bleach has been getting slightly darker of late, I never expected it to get this dark. BG9’s attack on Mareyo was a complete surprise, and although I like the idea of Bleach getting into more mature territory, the setup to this event was performed a little heavy-handedly. It seems that the only reason that Tite Kubo put Mareyo with her brother was so that she could be used as a bargaining chip later on. Speaking of the battle between Marechiyo and BG9, I was disappointed with the fact that, once again, Sui-Féng had to step in to help her Lieutenant. It would have been really interesting to see Marechiyo get angry, and maybe even unlock his Bankai, but predictably Sui-Féng jumped in before anything like that could happen. However, the fact that she perfected her Shunkou was a neat touch, as I honestly didn’t think that would ever have been brought up again after the fight with Yoruichi. To be honest, I’m glad that the Quincies weren’t beaten that easily. It just wouldn’t have made any sense for such powerful characters to have been killed by Captains who can’t even use their most powerful attacks. Plus, we’ve yet to see any of them use their Vollständig forms, like Opie did in his fight with Ichigo and Urahara (although, if any of the Vollständig forms look like Opie’s, maybe that’s a good thing). Overall, I enjoyed this week’s chapter. Sure, some parts of Marechiyo’s battle was heavy-handed, and Sui-Féng’s intervention was pretty obvious from the start, but it wasn’t enough for me to want it to be over. Good Things: Bleach is getting darker and darker. Good call back to Sui-Féng’s Shunkou technique. Pretty much all of BG9’s scenes. The Quincies haven’t been beaten yet. Bad Things: Both Mareyo’s scene and Sui-Féng’s appearance were easily foreseeable. ClayDragon is currently studying Physics at university, and is constantly bewildered by it. The main method of contacting him is his Gmail account at kyleroulston1993@gmail.com. The alternative is his Skype account at kyleroulston1993. When not playing games or reading, he can be found with his head in his hands whilst trying in vain to understand quantum physics. He is a self-proclaimed mad scientist. Alright, when I first read the chapter, I thought this: I knew Kubo wouldn't let Bazz B be defeated that easily. Ah, Bleach. The fight will probably last for 3 more chapters. A single character dying isn't all that dark(yet), and especially a character we've only seen for 1 chapter. Oh, yeah, what happened to Sui Feng's shikai? The 2-hit kill? Isn't that more advantageous than breaking his gun and revealing your whereabouts to the enemy? Sui Feng - master of secret assassination. Well, can't be worse than Naruto's orange camouflage jumpsuit. I think three chapters is a good estimate, but it might take longer if we begin to see more fights. It's not so much that a character's death is dark, it's more the fact that said character is about 9 years old. I think Sui Feng wouldn't have had enough time to do the 2-hit kill thing, it was either a case of do that and let Marechiyo die, or destroy the gun and save him. And let's face it, in all the anime I've seen, I have yet to see a ninja who's actually good at hiding. 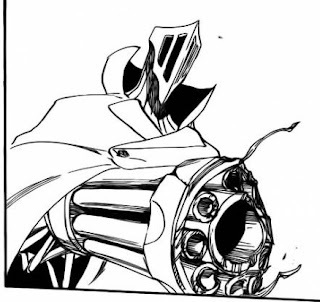 You could break the gun with one hand, and use the shikai with the other. Here's how I think the fight will play out. Sui Feng will attack from behind, there will be big panels, and Robo-Quincy will dodge that to appear behind her. Sui Feng will say she will use her shikai and there will be this big reveal about Robo-Quincy's ability. He/She(For all we know this could be another Yoruichi/Nelliel) will confidently launch the attack. 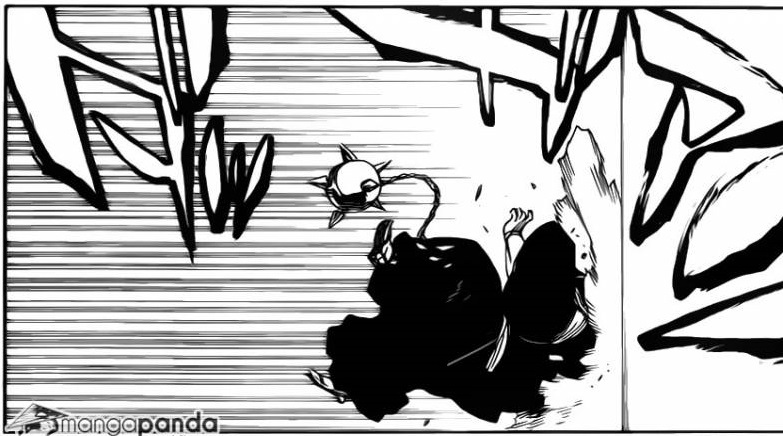 And the Sui Feng will dodge and get a hit with her shikai. Robo-Quincy will get a close saying something along the lines of, "you won't get another hit." The Sui Feng will say, "What makes you think......that I haven't use it from the beginning...?" Meanwhile, Aizen files a lawsuit. I think the fight might be like that, but I've had another look at the chapter and I don't see Sui Feng holding her Zanpakuto at all. For all we know, she might not even have it with her. And who would even process the lawsuit? Does the Soul Society have regulations for those kinds of things? Well, this is the same Soul Society that will eventually release Aizen in a couple thousand years, ("Deicide") and will throw people in prison if some one "thinks" they are doing something wrong (turn back the pendulum arc) so, hey, who knows if Soul Society has law? They probably have laws, but the people who enforce the laws (the Central 46, I think) are clearly incapable of making rational decisions.